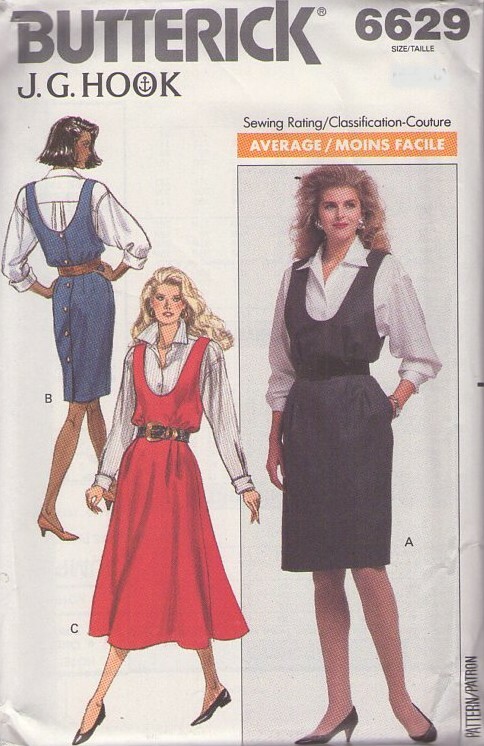 1988, 80s Career, Retro Designer Clothing Patterns - MISSES'/MISSES' PETITE JUMPER & SHIRT Jumper, above mid-knee, mid-knee or below mid-calf, has loose-fitting, blouson, lined, bodice, low, cut-in armholes, tapered or flared skirt and back-button closing. A,B: side pockets. Very loose-fitting shirt has collar, dropped shoulders, yoke with forward shoulder seams, back pleats, shaped hemline and long sleeves with pleats and button french cuffs. Narrow hem. Purchased belt.